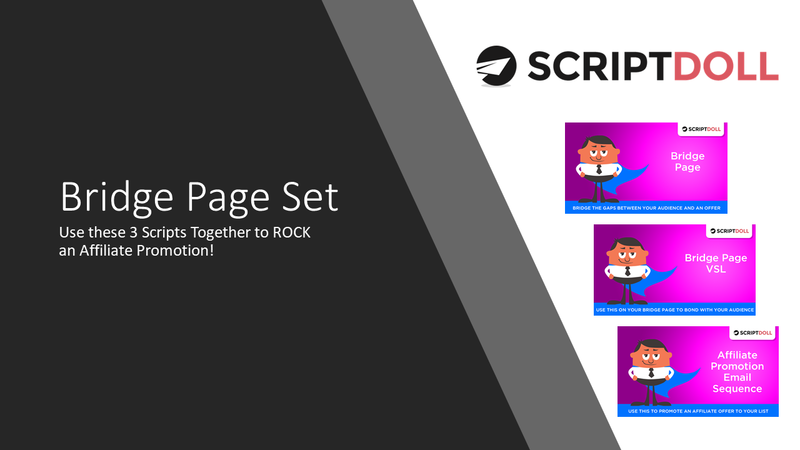 Today, we are launching 3 new scripts that we call the Bridge Page Set. When combined, these powerful scripts create an online sales and conversion device called a “bridge page”. It’s a page the “bridges the knowledge gap” between your audience and an a promotion. It’s incredibly useful when you are promoting another person’s product or you want to put a fresh spin on something you’re selling without altering your main sales page. You can use it to ROCK affiliate promos or for segmenting your list but presenting the same offer. Say I am promoting an Instagram product to a group that typically is just focused on selling via Pinterest (and the sales page I’m sending to says nothing about Pinterest). I would create a “bridge page” to explain the benefits to my Pinterest peeps, and to bridge to the main sales page. It works for both affiliate promotions as well as when you are trying to target multiple audiences but don’t want to write a brand new sales page for your main item. We use it all the time to rock affiliate promotions and make more sales. And now they are all inside of ScriptDoll! You know you want to use these amazing scripts to fill in the gaps of you calendar and rock your next affiliate promo. Don’t worry, we’ve got you covered. Hey, it’s Monica with ScriptDoll here and I think that you are going to love these new scripts that we have for you. They are our Bridge Page set. I call them the Bridge Page set because there’s a bridge page with a VSL on it, and then an email sequence for you to promote this. Now, you may be wondering: what is a bridge page? Well, a bridge page is a page that you can set up for an affiliate promo or for your own promos [00:00:30] that are targeted to a different audience. Basically, what it does is it bridges the gap between a sales page and your audience that you’re sending the message to. For example, say you’re promoting somebody’s membership software. Your audience, they’re not really into membership software. So you create a bridge page to bridge the gap between your audience and what they want and need to selling this software. There’s a very specific way you do [00:01:00] this. We are going to jump into that and I’m going to teach you guys how to use this powerful set of scripts together to make more money with your affiliate promotions and to make more money even on your own sales, to have an angle for the people you’re actually sending this promotion to. Let’s jump right in. Here we are inside of ScriptDoll and we’re looking at the Bridge Page script. This script is not a really long script. It’s basically a landing page for [00:01:30] your audience before they move on to the next page in the sequence, which would be the offer page. Usually this is an affiliate promo, but it could also be yours if you have a different audience and you want to bridge the gap between your offer and the audience that is slightly different than you wrote the original offer for. We start off with the offer headline and the tag. Pretty straightforward. They already have a relationship with you. You’re going to be sending this to your list. They already know you. Use your name and [00:02:00] the product name’s Bonus Package. A big key to making this work is the bonus package. That is because you are going to use this bonus package to bridge any gaps in their knowledge. For example, with the membership site software, people may think the software is great but they don’t know how to run a membership. So maybe you have a bonus package of what content to add to a membership site to keep people coming back. Maybe another bonus is how to build a community that [00:02:30] keeps itself going, sort of like a great Facebook group. Things like that. They know how to use the software, so when you actually sell them the software, they’ll have this great bonus package that will have them keep using the software and you probably make more commissions, because hopefully it’s monthly recurring. That’s why the bonus package is so important, so that your audience gets what they need to ultimately make the offer irresistible between your bonus package and the offer being presented to them. It starts off with here’s what you get inside of the product [00:03:00] name. This is going to be the features and benefits of the product that’s being sold. So if this is the membership site software, it’s going to be the membership site software. Then you’re going to insert a button that says get your product’s name and my bonus by clicking here. Send the receipt to your email address after purchase. Then we’re going to add this lovely little you’re protected by my personal guarantee as well as the product creator’s guarantee. This is important because you’re adding your [00:03:30] own guarantee. If you’re the one selling the product on the other side, then don’t add this. But if you’re doing an affiliate promo, maybe you say you’re protected by their 30-day money-back guarantee and my if it doesn’t work for you $100 gift card guarantee. Whatever you want to do. If you can add an additional guarantee, that’s super powerful because then your audience knows you have got some skin in the game too. That’s a big deal to them and they will respond by buying. So then we’ve [00:04:00] got a little bit of scarcity here. Hurry, the doors close in a countdown timer. Then here’s the bonus section. You’re also getting these amazing bonuses from me. Bonus number 1, why do you care? Bonus number 2, why do you care? And bonus number 3, why do you care? Then we have a little section here about why you’re recommending the product. This really is a place for you to tell the story of why you’re recommending the product. If you’ve got a personal story to share with this, this is even better. So if you’ve used the membership [00:04:30] software, or whatever it is that you’re promoting, tell that story here. If you have a success story with it, great. Be sure to tell them why you are promoting this product. Give them another buy button, same format as above. Then we’re going to get a little deeper into this product creator guarantee. We’re adding the you’re getting the I’ve always got your back guarantee. This is where you can insert your own guarantee here. This guarantee also acts as an additional bonus. You don’t call it out as [00:05:00] a bonus, but it really acts that way because your people will know that, again, you’ve got some skin in the game and you care. Then you’re going to add some proofs. Testimonials, if you’ve got videos that’s great, what other people are saying about this product is really important. Social proof is always great. Then just end with another buy button, personal guarantee, and the countdown timer. Like I said, not a very long script. If you didn’t notice, over here, there’s a VSL that goes on here. So [00:05:30] you’ve also got the VSL script for this. This is in the video sales letter section. The Bridge Page, by the way, is in the sales letter section of ScriptDoll. And this is, hi, it’s my name and I’m very excited to be presenting the product to you. Again, tell your story and then go ahead and go through the features, benefits, and your bonuses. This is a really short script, you guys. This page isn’t meant to be a full-on sales page. It’s really meant to just bridge the gap of knowledge between what you’re presenting to them after this page [00:06:00] and what you know your audience knows and loves. Now, I’m going to show you this page in action. This is what it could look like. I’ve got a link to this in the script so you can see it at the top. This is just a sample page of what this is going to look like in something like ClickFunnels. If you just scroll down, you can see we’ve got all those things set up right here. The product guarantee, everything that we just told you about. It’s right here. It’s laid out in a nice, pretty format so that you can get an idea for the visual. What you get inside the ASK Method. And then here’s a little picture that I updated because the method was closing that night. Get my ASK Method and bonuses. And then also the scarcity. There’s our amazing bonuses from me. Why I’m recommending the ASK Method. And hurry, the doors close in… My social proof. The one thing I didn’t do with this promotion [00:07:30] is do a personal guarantee. Honestly because I sort of ran out of time. So if you can’t get that in there, don’t worry about it. But this is definitely a fun little page. That’s how it works. So how do you get traffic to this page? Well, that’s what we have the affiliate promo sequence for. It is great for any affiliate offer. You could sub out the links and not use the Bridge Page, but the Bridge Page is super powerful. We’ve made it super easy for you. So use the Bridge Page. [00:08:00] The first email is the cold setup email, which is sent two to three days before the product is set to open for sale. Basically, you’re just going to get their feet wet a little and tell them part of your story, how you’ve been struggling with it, and things like that. Email 2 is the “this fits perfectly” email. This is going to be sent the day before the product opens for sale. You’re going to write a little bit more about your struggle, but then you’re going to spell out how you solved it. You’re going to write out the method in step form. [00:08:30] We’ve got an example for you that Ben posted on Facebook awhile ago. It’s a great example. These are the steps. What I want you to note in here is step 3, a software called Birdsong. Full disclaimer, my company built this for me because I needed a way to do what I’m about to show you. So basically, we built Birdsong for a specific problem and this is him basically spelling out how he used Birdsong. It [00:09:00] was harder before and then Birdsong made it easier. You can see that link, I’ve got it right here for you, you can always go check it out. You can see what I mean by write out the method in step form. What you’re selling should be a critical part in the process. Say you’re selling the membership site. You’re going to teach them how to run a membership, they’re going to need membership site software. So that’s an integral part of the process. Then you go on to say because this was such a big thing in my life, you wanted to share it and do an even bigger favor for them. [00:09:30] You went in and added bonuses. This is the first time they’re going to be introduced to your bonuses, which is great, because this is the “this fits perfectly” email. Next is when the product goes live. This is basically the, hey, click this link to get access email. And it’s really pretty straightforward. You guys can read it and use it, adapt it to your needs. The day after they open, you’re going to send out an FAQ-style email. If you looked on the Day 3 email, this last little line says “send me a reply to this email if you have any questions at [00:10:00] all.” So the next day you’re going to go ahead and send out any FAQs that you’ve got. They don’t actually have to be replies to your email. This is a great opportunity for you to overcome any objections that may be in your customer’s mind. If you think they’ve got an objection about something, put it in as an FAQ style and make it sound like you got a bunch of questions about it. This is really great for getting through those objections that some people have. This next email, you guys, this email is actually [00:10:30] the hardest one to write in this series. But it’s so important because the pattern break email gives your reader a chance to relate to you and for you to tell a story. The email here is insert a pop culture story that relates to your audience and transition it into your problem and solution. I put that in there, but I’ve got a couple of examples for you that I’m going to walk you through real fast. Both of these emails were sent as part of my ASK Method affiliate promo sequence. The first one [00:11:00] was a great story that I actually got when I was at the ASK Method accelerator from one of the other students named Rick. The subject line is “Before teaching Taylor Swift, Rick asked God to kill him.” Taylor Swift is very popular right now, she’s in the middle of putting out a new album. She’s kind of everywhere. This was the email. This is a pretty long email. This is why I say it’s the hardest one to write. Yours does not have to be this long. Just make sure you tell a good story. [00:11:30] I’m just going to point out a couple of things to you here. Rick asked God to kill him. He literally said these words, and then I went on to have this conversation he had with Taylor Swift where she said, “I want a gold record,” and Rick said, “Okay. To sell the 500,000 records that you need, you need to make 500,000 fans.” And there it is. Taylor’s secret to success works in any business. Build relationships with your audience based on trust. That is essentially what the ASK Method is teaching. That’s [00:12:00] what I said next. That’s why I spent the weekend away from my family, learning the ASK Method with Ryan and Rick. So I can make ScriptDoll better for you. Then I said when I asked you said you have a hard time knowing your audience and avatar. So check out this video. In it, Ryan teaches a simple Google trick that I think you’re going to love. This particular video actually does solve one of these knowing your audience problems. This was Rick’s story. Please don’t use this yourself. The next email I use, feel free to use it all you want, but this is actually Rick’s story. I got permission to use it. [00:12:30] So I don’t want to be sharing it all over the place, but that is a great example of this pop culture story that relates to the audience and transitions it. The other email is “My two marketing a-ha moments while reading the mail yesterday.” That was the subject line. These got great responses, by the way, you guys. So this story is actually about how I got coupons from my grocery store and realized that I’m in the middle of a repeat customer funnel with an upsell. Which is a very marketing thing, I’m talking to marketers. ScriptDoll audience is a bunch [00:13:00] of marketers. This story is amusing to them. Here’s my transition note. And I’m delighted to be in this funnel because I get what I want and what I need. You can delight your customers like this too by knowing exactly what they need. You can increase sales, you can collect money. Sound like a plan? Yes. Then this is how I transitioned into the ASK Method. These are two examples that you can use to create your own stories. Email 6 [00:13:30] goes out the morning of closing day. So whatever day your promo ends, send this out in the morning. Basically, it’s a call to action. The last email that you’re going to send in this sequence is around the last day of the product for sale. You’re basically recapping all that they get and why they should care and reminding them that they’ve got a very tight deadline to make things happen. Use this email sequence to drive traffic to your Bridge Page where you’ve got the Bridge Page script and your VSL. I did want to tell you guys one more thing about this while [00:14:00] using ScriptDoll. I’ve shown you scripts without using a profile. So I just want to show you guys something about setting this up using a profile. If you set it up using a profile, then you’d be able to generate all these three scripts really quickly using the same information so they’re nice and cohesive and your audience gets the same message over and over and over. Consistency is so important to your brand. That’s why we have the product profile is so that when you do create a set of copy, [00:14:30] like these three scripts together, that they match. If you’re doing this for this particular set of scripts, go ahead and fill out the product details, the struggle and other solutions, the obstacles, change, and accomplishments, the features and benefits, the guarantees and testimonials, the scarcity and call to action, and the company information for the main offer. That is for the affiliate promotion that you’re doing, or if it’s your main offer, use that. The bonus section, this is where you’re going to want to put in [00:15:00] your bonuses that are specific to your bridge page. Again, all this, fill out as if you were promoting the main product, and then add the bonuses that you’re adding. That is just one little key difference I wanted to point out for this particular set of scripts. That’s it, you guys. This is how you rock out an affiliate promotion. If you already have a list and you’re not promoting some sort of affiliate offer to them in the downtime, you should be. Your audience needs to hear from you even if it’s a promotion. The more they hear from [00:15:30] you, the more they’re going to get to know you and the more they’re going to buy from you. So if you’ve got an empty spot on your calendar and there’s nothing going on for a week, look for an affiliate promotion that you can put in there and get your audience to trust and love you more because you’re giving them solutions to their problems while putting some money in your pocket. These scripts are available in ScriptDoll now. If you’re not a ScriptDoll user, look below to find out how you can become one. Thanks so much for listening and I hope you have a fantastic day!